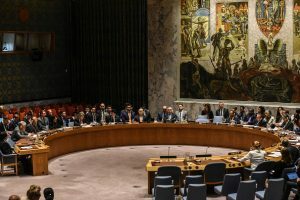 UNITED NATIONS (Reuters) – The United Nations Security Council unanimously stepped up sanctions against North Korea on Monday over the country’s sixth and most powerful nuclear test on Sept. 3, imposing a ban on the country’s textile exports and capping imports of crude oil. It was the ninth sanctions resolution unanimously adopted by the 15-member council since 2006 over North Korea’s ballistic missile and nuclear programs. The United States watered down an initial tougher draft resolution to win the support of Pyongyang ally China and Russia. Textiles were North Korea’s second-biggest export after coal and other minerals in 2016, totaling $752 million, according to data from the Korea Trade-Investment Promotion Agency. Nearly 80 percent of the textile exports went to China. The resolution imposes a ban on condensates and natural gas liquids, a cap of 2 million barrels a year on refined petroleum products, and a cap on crude oil exports to North Korea at current levels. China supplies most of North Korea’s crude. A U.S. official, familiar with the council negotiations and speaking on condition of anonymity, said North Korea imports some 4.5 million barrels of refined petroleum products annually and 4 million barrels of crude oil.